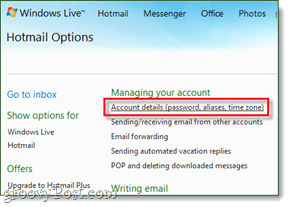 How to Permanently Delete Your Hotmail and Windows Live Account ? Companies usually give you a bit of guff when you try deleting an account with them, but Microsoft has a relatively few number of hoops to jump through to do so. No matter the reason for deleting your account, the process remains the same. There are three processes on the way to completely deleting your Microsoft account. Follow these in order. 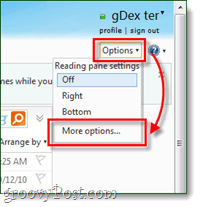 Sign into your Hotmail or Windows Live account. Now open up your Hotmail inbox. From your inbox Click Options > More options* from the box that appears in the top-right corner, just below your username. Once the options page loads, Click Account details (password, aliases, time zone) under the Managing Your Account subheading. *Interestingly enough, I couldn’t find a button to access account options anywhere else on live.com. Scroll down to the bottom of the account details page and Click the Close your account link. Now you’ll likely see a page like the one in the screenshot below, which tells you that you cannot close your account because of reason xyz. It’s hogwash, all of it. But on every Live Hotmail account I attempted to close, I ran into this or a very similar window. You’re blocked from deleting unless you know the secret deletion URL that bypasses this whole process. 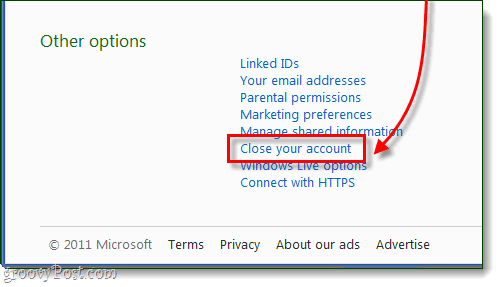 If the above steps didn’t work for you, which is likely, you’ll need to use the super-hidden deletion link: Click here to go directly to the account closure confirmation page. 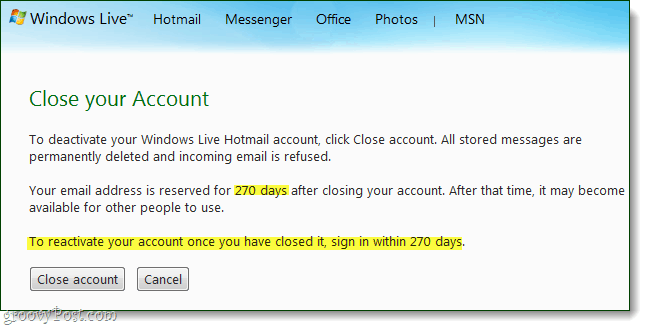 Hotmail will notify you of what we already know; it will take 270 days to permanently close the account. Geez, and I thought Facebook’s 2-week policy was bad! Well, at least Hotmail isn’t publicly displaying your emails. Click Close account and don’t sweat it. If you want your account back, all you have to do is log in, and the whole deletion process is canceled. Assuming that the close account button worked this time, you’ll see a confirmation page letting you know your account data will be deleted. About that: Before writing this I let an account sit closed for two weeks. Now, I just reactivated it, and all of my email messages and contacts are sitting right where I left them. Perhaps by a “few days,” Hotmail means a “few months.” Maybe it doesn’t even delete your messages until the 270 days are up? I don’t know, and I sure don’t want to cancel it halfway through to find out, but it is a possibility. Deleting your Windows Live Hotmail account is a lot harder than it should be unless you know about the secret closure-confirmation link.